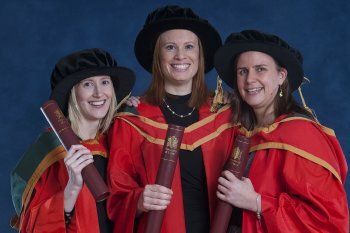 The 2013 Winter Graduation ceremonies came to a close at the University of Ulster on Thursday as students from the University’s Ulster Business School received their degrees and awards at the Jordanstown campus. At the morning ceremony, a Distinguished Enterprise Fellowship was conferred on Janet Coulter, Senior Lecturer in Fashion, in recognition of her contribution to academic enterprise and the building of links between the University and the commercial world. Over the past three days, over 1000 students from the University’s four campuses have received degrees and other awards. The deepest historical roots of the University of Ulster lie at its Belfast campus, home to the Faculty of Art, Design and the Built Environment. It was in 1849 that the Government School of Design opened its doors in Belfast. That School of Design later became the Belfast Art College, which joined the University of Ulster in 1984.